Now, Japanese scientists have quantitatively confirmed how energetic this phenomenon can be. 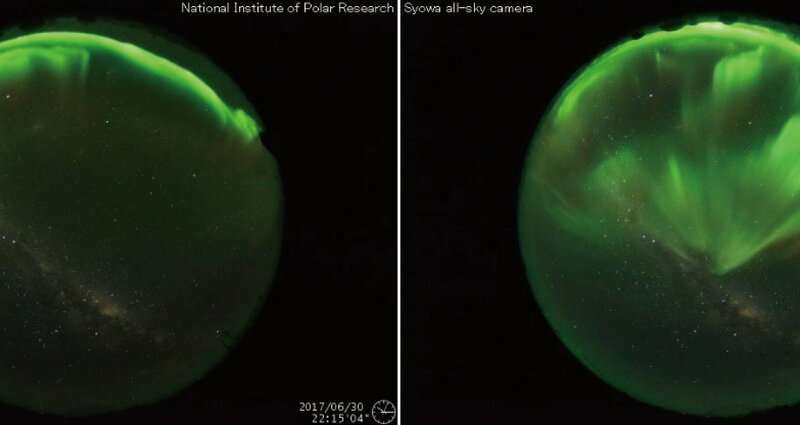 Using a combination of cutting-edge, ground-based technology and new space-borne observations, they have demonstrated the essential role of an auroral breakup in ionizing the deep atmosphere. The research advances the understanding of one of the most visually stunning natural phenomena. The findings were published in Earth, Planets and Space on January 23, 2019. In the new study, the scientists report that, contrary to conventional thinking, a specific type of electrons with much higher energy, called radiation belt electrons, are involved in the auroral breakup. Named after their location in the Earth's radiation belt, radiation belt electrons had not been clearly associated with auroral breakups before. The research team based their conclusions on a dataset collected via advanced technology and simulations. "Radiation belt electrons are released from the Earth's magnetic field and charge the mesosphere during auroral breakup. This fact was quantitatively confirmed by both cutting-edge, ground-based and new space-borne observations," adds Ryuho Kataoka, Ph.D., associate professor at the National Institute of Polar Research and the corresponding author. "This study also provides a good example how Arase satellite and PANSY radar can collaborate to understand the connection between space and atmosphere." In their future research endeavors, Professor Kataoka and his team hope to understand how the radiation belt electrons are released during the short-lasting period of auroral breakup. "The ultimate goal is to understand the interplay between auroras and radiation belts," Professor Kataoka adds.